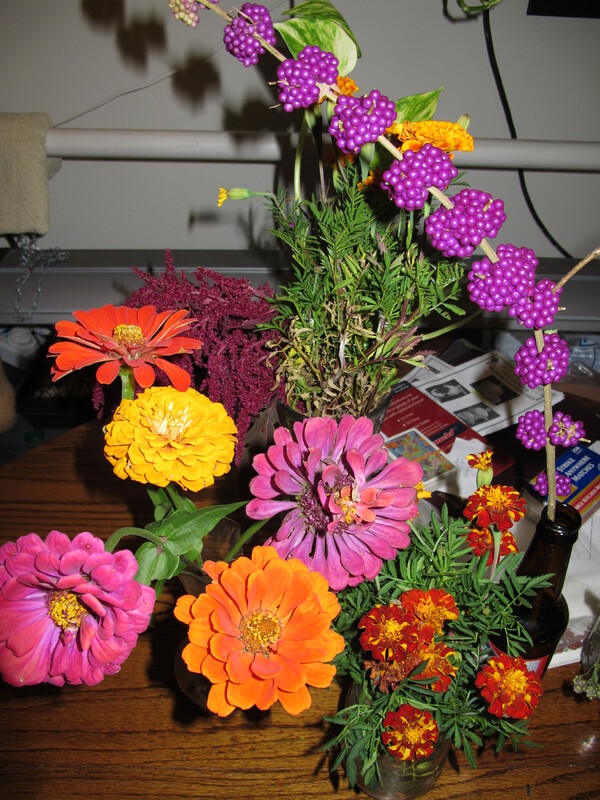 We’ve been enjoying the fall flowers brightening up our apartment these last few weeks. 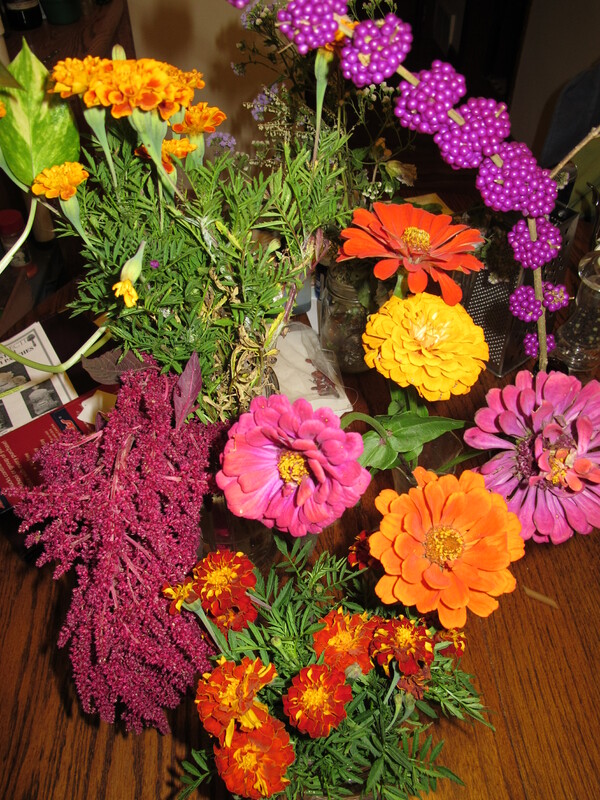 When we planned our wedding, I had the delusion that maybe, if we had a very nice, mild fall, I could carry a homegrown (or at least locally grown) bouquet down the aisle in mid-November. Turns out, not so much. My MIL made some beautiful dried flower (and other natural product) arrangements to decorate the altar and pews, but for the bouquets and boutonnieres, I reluctantly resorted to conventionally grown flowers (with all the chemical nastiness and poor working conditions for people in other countries 😦 ), but in an unconventional way. See, just like many grocery stores and restaurants throw away unconscionable amounts of food every day, large florists do the same thing — but with flowers. Dumpsters full of perfectly good flowers! Or almost perfect flowers that just need a little TLC. With a little A LOT of help from our personal floral guru, we created some beautiful arrangements from flowers (including lots of roses) that would have otherwise taken up space in a landfill. Not a bad compromise! Still, I would have preferred to walk down the aisle with flowers (and greens — like basil!) from my own garden, and if this is a priority for you or anyone you know who will be planning a wedding soon, I encourage you to consider local flower availability when setting your wedding date. This entry was posted in Green Ideas, My Life and tagged flowers, green wedding, weddings. Bookmark the permalink. We did use store bought flowers for my bouquet. But, all other flowers were hand made porcelain with random collected bead centers, lavendar form our garden for the women, and rosemary from the garden for the men. They were made by my FIL and myself morning of and we had a great time and the flowers made for great discussion, and yep fairly green, although the potter did not earn fair wages…that was me, :).